Please take care at all times! If a mishit shot is heading in the direction of other people, you must shout “FORE!” in a loud voice to alert them of possible danger. Players should not strike a golf ball when there is the risk of endangering other players, members of the Green Staff and all other users of the golf course & its surroundings. Where available, please use any steps provided to access tees. Take care when entering and exiting bunkers – use the shallowest part of the bunker to do so. In the event of fog, only play when you are sure it is safe to do so. Do not lick golf balls or fingers due to chemicals being used on the golf course. When play is suspended by the Committee for a dangerous situation, if the players in the match or group are between the play of two holes, they must not resume play, until the Committee has ordered it resumed. If they are in the process of playing a hole, they shall discontinue play immediately and must not play until the Committee has ordered play resumed. If a player does not discontinue play immediately, they shall be disqualified unless circumstances warrant waiving such penalty. When play is suspended by the Committee, any players in a match or group between holes, must not continue play until the Committee has ordered play to be resumed. If they have started to play a hole they may choose to discontinue play immediately, or continue to play the hole, provided they do so without delay. If the players choose to continue to play the hole, they are permitted to discontinue play before completing it. In any case, play must be discontinued after the hole is completed. Players must resume play when the Committee has ordered play resumed. Players whether they be on the course or in the Clubhouse will be informed that play will re-commence shortly and will be given sufficient time to reach the point on the golf course where they were when play was suspended. Players will be notified when it is safe to resume play by two short notes of the siren. No players shall resume play until the two notes of the siren have been sounded. All golfers must ensure that they are adequately insured in respect of the risks involved with the playing of golf. Hole 1 – Slopes to the back tee. Players to the left (Practice Ground), right (on 9th) and beyond the green (on 2nd tee). Hole 2 – Banks to tees. Players to the right on the 1st Green. The general slope from tee to green. Banks around the side and rear of the green. Players beyond the green on 9th tee. Hole 3 – Slopes to tees. Players to the right of tee (on 8th green). Possible blind tee shot. Players to the right of the fairway (on 4th). Hole 4 – Slopes to tees – use the steps. Do not use shelter when thunder and lightning is present. Possible blind second shot. Slope down to the green. Ditch in front of the green. Banks to the rear and sides of the green. Hole 5 – Banks and slopes to tees – use steps. Possible blind tee shot. Players to the right (on 6th tee). Players beyond the green on 14th green. Hole 6 - Do not use shelter when thunder and lightning is present. Use steps to the tee. Possible blind shot – wait for the bell to sound. Players on left (playing 14th & 13th) and right (7th). Ditch in front of green. Use the bridge on the right to access green. Hole 7 – Slopes to tee. Do not use shelter when thunder and lightning is present. Drinking fountain available. Players to the right on 6th and beyond the fairway on 8th (and 8th tee). Hole 8 – Care with blind tee shot – wait for bell. Players on left playing 7th and also beyond the green on the 3rd tee. Buggies to follow signs – keeping to the left of the ditch. Ditch in front of fairway. Fairways slopes right to left. Hole 9 – Slopes to the tee – use steps. Players to the right on the 1st and left on the 10th tee. Slopes around the green to the left and rear. Hole 10 – Ditch in front of tee – use bridge. Players to the left on 11th and right on 17th. Hole 11 – Banks to tee. Players on left playing 10th and right on 13th tee and 12th. Ditch in front of green – use bridge. Banks to the rear of the green. Hole 12 – Slopes to tee. Players to the left on 6th green. Hole 13 – Players to left on 12th green. Ditch short of fairway. Players to the left and beyond the green on 6th fairway. Hole 14 – Do not use shelter when thunder and lightning is present. Ditch short of fairway. Players to the left on 13th green and 6th hole and right on 15th and then when playing to the green, to the left on 5th green and to the right on the 15th tee. Hole 15 – Banks in front of the tee. Ditch short of the fairway. Players to the right on 14 & 13 and to the left at the green on the 16th tee. Hole 16 – Banks to the sides and rear of the tee. Road crossing the fairway leading to the Greens Compound. Any ball leaving the course to the left must be reported on return to Clubhouse. Hole 17 – Slopes to tees – use steps at the front of the tee. Players front right of tee on 10th green. Players on right on 10th. Deep lake. in front of green. Players to the left on 18th tee. Hole 18 – Players to the left on 17th and 17th green. Deep lake in front of tee. Use the bridge on the left. - In case of emergency, dial 999 – the address of the club is Station Road, Kirby Muxloe, Leicester LE9 2EP. - The Club’s telephone number is 0116 2393457. - All players must adhere to suspensions of play. 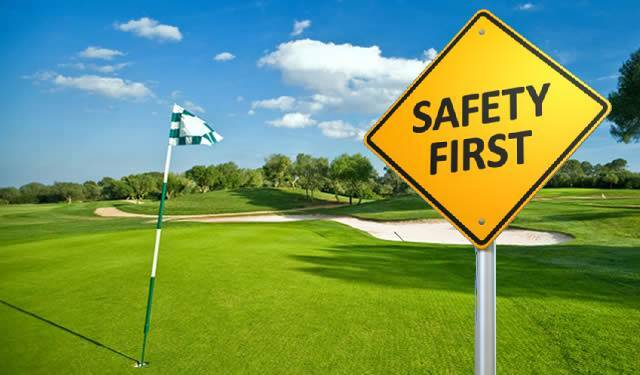 - Players should be mindful of the health and safety of themselves, other players and workers on the course. THESE HEALTH & SAFETY GUIDELINES CAN BE DOWNLOADED HERE.